Katishan’s narrative is about the origin of the southern Tlingit “secret societies,” whose members wore ermine headdresses and cedar bark rings at potlatches where they performed rituals of spirit possession. These societies – called Dancer, Destroyer, and other names - originated in Canada among the Kwakwaka’wakw (Kwakiutl) and spread north to the Bella Bella, Tsimshian, Haida, and Tlingit a short time before contact with Europeans. Today, potlatch song leaders wear the bark rings. 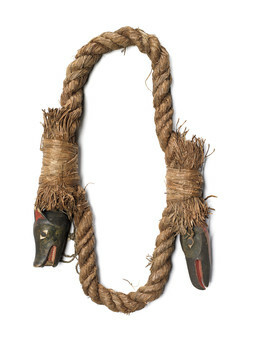 This ring of cedar bark rope is adorned with two carved crests, Wolf and Eagle.